It is an established fact that Thyroid function is related to body mass index (BMI) in adult populations and therefore its variation could effect Maternal prepregnancy obesity and excessive gestational weight gain leading to pregnancy complications. Dr.Fernanda M. Collares and associates in a population-based prospective cohort study analyzed the relationship of variations in thyroid function in early pregnancy with changes in body mass index (BMI) and weight gain in women during pregnancy. The found that higher maternal TSH levels and lower FT4 levels in early pregnancy are associated with a higher pre-pregnancy body mass index and gestational weight gain. In the study, the researchers measured maternal TSH and FT4 levels at 13.5 weeks of gestation (95% range: 9.7–17.6 weeks) in a population-based prospective cohort study conducted among 5726 mothers. Maternal weight was assessed before pregnancy and in each trimester. It was found that higher maternal TSH levels were associated with higher prepregnancy BMI (difference: 0.18 kg/m2 [95% CI: 0.01, 0.36] per SD increase in maternal TSH level) and higher total gestational weight gain (difference: 0.02 kg/wk [95% CI: 0.01, 0.03] per SD increase in maternal TSH level). Higher maternal FT4 levels were associated with lower prepregnancy BMI (difference: −0.44 kg/m2 [95% CI: −0.63, −0.26] per SD increase in maternal FT4 level) and lower total gestational weight gain (difference: −0.01 kg/wk [95% CI: −0.02, −0.01] per SD increase in maternal FT4 level). The associations of maternal thyroid function with weight gain in early pregnancy were stronger than those with weight gain in mid and late-pregnancy. Maternal hypothyroidism was associated with higher prepregnancy BMI and early pregnancy weight gain, whereas opposite effects were observed for maternal hyperthyroidism (P<.05). The researchers concluded that Higher maternal TSH level and lower FT4 level in early pregnancy are associated with higher pre-pregnancy BMI and higher gestational weight gain. 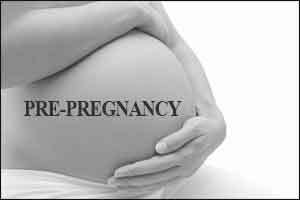 Further studies are needed to explore maternal and foetal consequences.